. "Mark Tewksbury". The Canadian Encyclopedia, 04 March 2015, Historica Canada. https://www.thecanadianencyclopedia.ca/en/article/mark-tewksbury. Accessed 20 April 2019. Gold medal winner at the Barcelona Olympic Games (photo by Ted Grant/Canadian Sport Images). 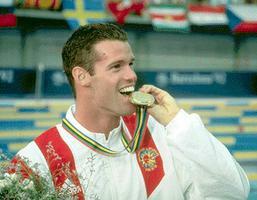 Mark Tewksbury, swimmer (b at Calgary 7 Feb 1968). 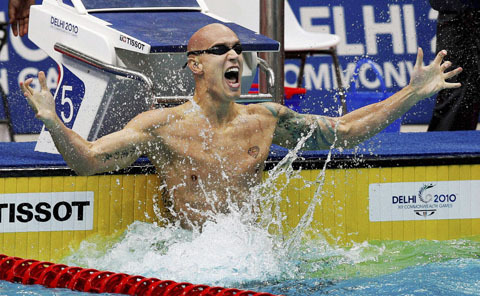 He began swimming at age 8 after watching coverage of the 1976 Olympic Games in Montreal. Tewksbury joined the National swim team at the young age of 16 in 1984 and had his first international success at the 1986 Commonwealth Games where he won gold in the 100m backstroke. Disappointed with his individual performances at the 1988 Olympic Games in Seoul (5th in 100m backstroke, 12th in 200m backstroke) he rebounded to have a brilliant swim in the 4 x 100m medley relay, powering Canada to a silver medal. Tewksbury considered retiring but felt there was much left for him to accomplish in the pool. Long considered one of the premier backstrokers in the world his weakness had been the start and the turns. Intensified training led to improvement in these areas and he was able to repeat his Commonwealth Games 100m gold in 1990. At the 1991 World Aquatic Championships, he was narrowly beaten by 6/100ths of a second by American Jeff Rouse and had to settle for the silver medal. 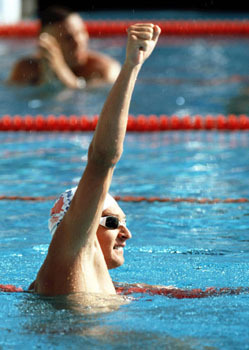 In 1992 he set a world short course record for the backstroke in preparation for the Olympics. At the games in Barcelona he trailed Rouse by half a body length after the turn. A superior swimmer, he powered through the final 25 metres to edge Rouse by the identical 6/100ths of a second margin he had lost by in 1991 to capture the gold medal in an Olympic record time of 53.98 seconds, a mere 5/100ths of a second shy of a new world record.